Even if you aren’t heading back-to-school, there is still a chance you will be affected by those who are. Not only could there be more cars on the road during rush hour, but you will have to be aware of new obstacles such as children running into the street or a school bus making frequent stops. And come Halloween, you should be mindful of an onslaught of ghosts, skeletons and mini-Elsas. Chilly fall mornings often are accompanied by a thick blanket of fog, especially if you live near the water. This doesn’t make for the best driving conditions so drive slower than normal and allow more space between you and the vehicle in front of you so you have an adequate amount of time to stop. If your car is equipped with fog lights or driving lights, switch those on because their low-mounted position minimizes fog reflection. Contrary to what your instincts might tell you, it actually isn’t a good idea to use high beams because they direct light into the fog making it difficult to see. Those chilly fall mornings can also lead to accumulation of frost on your car. Clear frost away before you start driving so your visibility is not impaired. Make sure your heater and defroster systems are working properly, and if you notice anything that seems off, have a mechanic check it out before it’s too late. You should also be aware of hidden icy spots on the road. Follow these tips, grab yourself a Pumpkin Spice Latte and you will be more than prepared for the incoming chill. 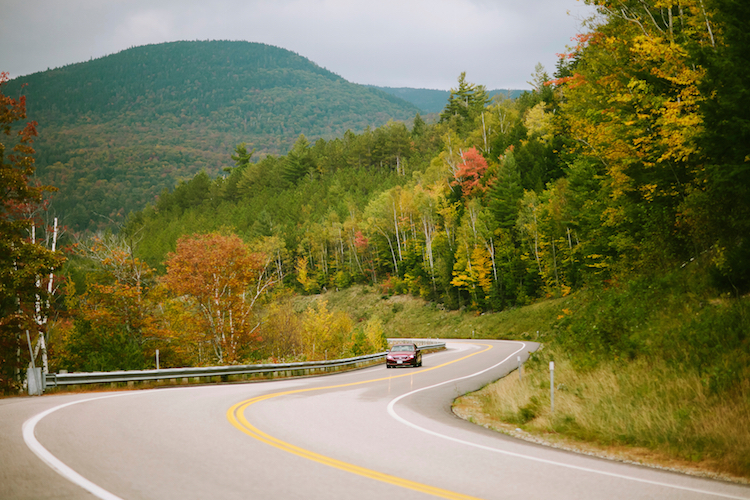 And if you are thinking of taking an autumn-inspired road trip, Metromile’s per-mile insurance customers aren’t charged after 150 miles per day (250 in WA), so go ahead and drive to a prime leaf-viewing location. Just be careful when you are behind the wheel! If it is raining or recently rained, one needs to remember to keep a safe distance. Wet roads and leaves can make for slippery situations. I have fog when I drive. Not only rain but fog also can be dangerous when you are behind the wheel.